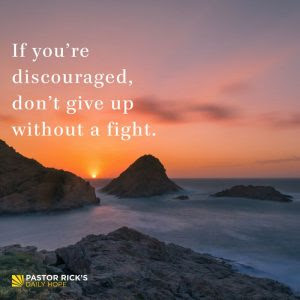 The apostle Paul teaches that we need to resist discouragement: “Let’s not get tired of doing what is good. At just the right time we will reap a harvest of blessing if we don’t give up” (Galatians 6:9 NLT). · How do I handle failure? · When things don’t go my way, do I get grumpy? · When things don’t go my way, do I get frustrated? · When things don’t go my way, do I start complaining? · Do I finish what I start? · How would I rate on persistence? When an artist creates a sculpture, he has to keep chipping away. He doesn’t hit the chisel with the hammer once, and suddenly all the excess stone falls away, revealing a beautiful masterpiece. He keeps hitting it and hitting it, chipping away at the stone. The fact is that great people are really just ordinary people with an extraordinary amount of determination. Great people don’t know how to quit. What does your attitude toward tough situations reveal about your faith?